Here we use the shorthand notation of Section 41-9 to identify the subshells. Recall, for example, that the subshell with principal quantum number n = 3 and orbital quantum number I = I is called the 3p subshell; it can hold up to 2(21 + I) = 6 electrons; the number it actually contains is indicated by a numerical superscript.We see above that the first six subshells in copper are filled, but the (outermost) 4s subshell, which can hold 2 electrons, holds only one. electrons. When the wave functions of the two atoms overlap, we speak not of two independent toms but of a single two-atom system; here the system contains 2 X . 29 = 58 electrons. The Pauli exclusion principle also applies to this larger system and requires that each of these 58 electrons occupy a different quantum state. In fact, 58 quantum states are available because each energy level of the isolated atom splits into two levels for the two-atom system. If we bring uP.more atoms, we gradually assemble a lattice of solid copper. 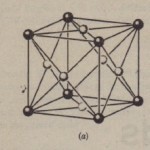 If,say, our lattice contains N atoms, then each level of an isolated copper atom must split into N levels in the solid. Thus, the individual energy levels of the solid form energy bands, adjacent bands being separated by an energy gap, which represents a range of energies that no electron can possess. A typical band is only a few electronvolts wide. Since N may be of the order of 1024, we see that the individual levels within a band are very close together indeed, and there are a vast number of levels. Figure 42-3 suggests the nd-gap structure of the energy levels in a.generalizedcrystalline solid. 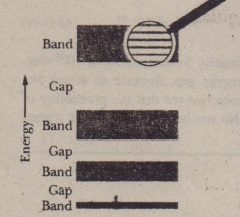 Note that bands of lower energy are narrower than those of higher energy. This occurs because electrons that occupy the lower energy bands spend most of their time deep within the atom’s electron cloud. The wave functions of these core electrons do not overlap as much as the wave functions of the outer electrons. Hence the splitting of these levels is not as great as it is for the higher energy levels normally occupied by the outer electrons.